How big is the newspaper industry? What challenges are newspapers facing? My Sunday newspaper still arrives as fat as a phone book, full of advertisements. What is the problem? In the age of the Internet, why are newspapers important? Would doubling or tripling the cost of a newspaper make a difference? Are any newspaper companies seeing revenue growth? What is being done to address the underlying financial problems facing the industry? When will online revenues begin to make up for the losses in traditional print media? The United States newspaper publishing industry is a $59 billion industry employing approximately 356,000, according to the Newspaper Association of America and the U.S. Department of Labor. The newspaper business is beset by problems on all sides. According to The Vanishing Newspaper, by journalism professor Philip Meyer, the industry peaked early in 1920s, when the average household read 1.3 newspapers a day. By 2001, almost one out of every two households no longer read a newspaper. To look at it another way, four in 10 Americans indicate they read a newspaper yesterday, compared to a decade ago, when one out of every two Americans said they did on a typical day, according to the Pew Reseach Center. More readers are turning to other outlets incuding cable television, online news sites, blogs, and news aggregators like Google and Yahoo! News. The underlying value driver for newspapers continues to be circulation, according to industry analysts. Circulation still accounts directly for only 15 percent to 20 percent of an average newspaper's top line, but explains 85 to 90 percent of the variance of advertising rates. As Meyers notes, when newspapers had a near-monoply over retailers' access to customers, publishers enjoyed high profits. Today, as the industry grapples with competing platforms, it has become increasingly difficult to maintain profit levels of 15 to 20 percent without implementing cost-cutting measures. Publicly owned newspapers are beholden to the demands of Wall Street, where investors measure their value based on how much money they make and how much money they will make in the future. In recent years, institutional and outside investors have pressured publicly held newspaper chains to sell off individual papers. Many newspapers including The Philadelphia Inquirer, the Los Angeles Times, Newsday, The Dallas Morning News, the San Francisco Chronicle, and the St. Louis Post-Dispatch have cut their staffs. Some 2,800 full-time newspaper jobs have been lost so far this decade, according to the Project for Excellence in Journalism. Other newspapers have shut down pressrooms and closed overseas bureaus. A typical newspaper with a 100,000 circulation makes a 15.6 percent annual pre-tax profit margin, according to Inland Daily Press Association and the International Newspaper Financial Executives. 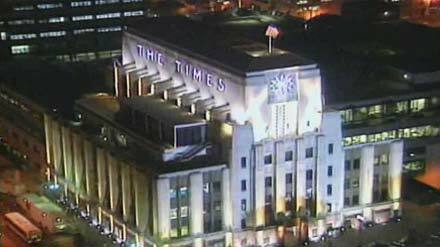 The Tribune Company, which owns the Los Angeles Times, Chicago Tribune and other media outlets, for example, operates on an 18.3 percent pre-tax profit margin. Gannett, which owns 90 newspapers in the U.S., including USA Today, operates on a 21.4 percent pre-tax profit margin. By comparison, Walmart Stores Inc. operates on a 5.4 percent pre-tax profit margin, while Exxon Mobil Corporation operates on a 17.9 percent pre-tax profit margin. But the future growth and profit margins for the newspaper industry are uncertain. As Meyers notes, the financial analysts who advise institutional investors make their reputations on their ability to predict the future. As a result, some of the leading financial analysts are advising their clients to stay away from investing in the newspaper industry until they can be certain what the growth rate will be. John Carroll, the former editor of the Los Angeles Times, estimates that 85 percent of the original reporting that is done in the United States is done first by newspapers; very few online sites are doing original reporting. Dean Baquet, who succeeded Carroll as editor of the Times, agrees. "First off, if we disappeared tomorrow, most of the people who call us dinosaurs would disappear, too," he explains. "All the bloggers who exist to comment on us, the Googles and Yahoo!s ... who rely on what we cover in the Middle East, who rely on what we write about in California, and the nation, and Washington; they wouldn't exist if we didn't. Our economic model is, obviously, threatened. But if we disappeared tomorrow, they might have to reinvent something that looks like us." According to John Morton, a newspaper industry analyst and a columnist for American Journalism Review, newspapers have found that increasing the price of a newspaper has a huge negative impact on circulation numbers, which can be devastating on the rates that a newspaper can charge for advertising revenue. Currently newspapers are trying to stop the declines in circulation, so they're very reluctant to increase the price of the newspaper. Ethnic press, in particular Spanish-language press, is faring well with the continuing growth of immigration. The free alternative weekly press also continues to thrive with circulation reaching 7.64 million in 2005, the highest since 2001. Advertisers consider alternative weekly readers a desirable audience because they are more likely to stay in a hotel, rent a car, attend a concert, and frequent a bar than the market as a whole, according to the 2006 State of the News Media report. Newspapers, like other traditional media, appear to be moving toward technological innovation and investing online. In addition, some newspaper companies are linking up with Internet giants like Yahoo! to grow online classified ad revenue and boost content. Others are diversifying their company by offering to distribute satirical newspapers, as well as investing in niche publications to serve smaller, specialized audiences based on age or ethnicity. Some large newspaper companies are also investing in non-news industries, including The Washington Post Company, which owns the test preparation company, Kaplan Inc.
At this point, newspapers can't make up the difference for what they are losing when a person switches from subscribing to the newspaper to going online for content. Media Analyst Rick Edmonds of the Poynter Institute estimates that a Web ad generates only 20 to 33 cents for each dollar lost in print revenue when an advertiser switches part of their advertising online. Another analysis, conducted by the consulting firm Bain & Company, found each unique online user generates between $5 and $10 a year in advertising revenue compared to $1,000 a year generated by a reader of a major newspaper. Online revenues at newspapers in recent years continue to grow at an average rate of more than 30 percent a year. Assuming that ad rates for online and print ads stay roughly where they are, if online operations sustain an unlikely 33 percent annual growth, it will be 2017 or 2018 before they have bulked up to the size of the slower growing newspaper divisions, according to the Project for Excellence in Journalism. The State of the News Media is an annual report on American journalism presented by the Project for Excellence in Journalism, which tracks trends in the industry. Rick Edmonds, a media business analyst for the Poynter Institute in St. Petersburg, FL writes about how growth, not higher profit margin, has become the focus for newspaper companies. This publication, produced by the Newspaper Association of America, is designed to serve as a reference for anyone interested in the facts and figures behind the newspaper industry. Jonathan Jones was a researcher for "News War: What's Happening to the News."